Enjoy the taste of luxuriousness with Peach Pear by Juice Head E Liquid. This delectable juice combines the succulence of pear with the deliciousness of peach for a combo that is simply off the charts. Juice Head E Liquid have proven themselves to be experts in the field of mouth-watering e juices and Peach Pear speaks to this fact. Your tongue and taste buds will be completely exhilarated by what is to come. If you're ready to teleport to the Caribbean Island, you already know what to do. Grab a bottle of Peach Pear by Juice Head. You deserve it. 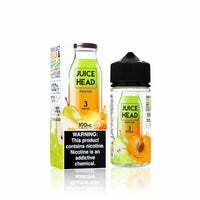 Peach Pear - Juice Head E Liquid has a rating of 4.5 stars based on 2 reviews.